Home » Telugu » News » These Baahubaali 2 and Avengers memes are going viral and you need to see! These Baahubaali 2 and Avengers memes are going viral and you need to see! Interestingly, Avengers: Infinity War and Baahubali 2 released in the same week in China as well. Now, Movie buffs in China have come up with their version of memes. 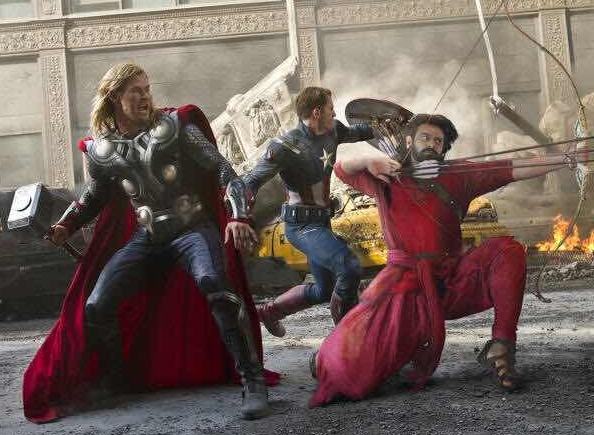 Hollywood release- Avengers: Infinity War, which also released in other languages, received a huge response across the globe and has set a record for a huge Hollywood release in India. Interestingly, Avengers: Infinity War and Baahubali 2 released in the same week in China as well. Now, Movie buffs in China have come up with their version of memes about Avengers and Baahubali, and they are hilarious. The users of a WeChat, a Chinese multi-purpose social media app, are indulging themselves with memes of the Marvel universe, with Baahubali. Did you ever think what would happen if Baahubali met Black Panther and Iron Man? We have across some memes that see Baahubali 2 actors interacting with the superheroes. Avengers: The Infinity War stars Robert Downey Jr, Mark Ruffalo, Benedict Cumberbatch and Scarlett Johansson. The film also features Chris Evans, Chris Hemsworth, Chadwick Boseman and Tom Holland. Talking about Baahubali 2 franchise, the sequel to SS Rajamouli’s 2015 blockbuster, Baahubali: The Beginning finally answered the most asked question of the past two years, “Why Kattappa Killed Bahubali”. Baahubali: The Conclusion, released two weeks ago in China and has made Rs 72 crore in China so far. The first Baahubali movie had ended with a mystery, which eventually got solved in the second part of the blockbuster. The film sees ensemble star cast with talented actors like Prabhas, Rana Daggubati, Anushka Shetty, Ramya Krishnan, Nassar, Sathyaraj, Tamannaah, Subbaraju and few more. baahubaali pretty much would have died even before Kattappa kills him, he had multiple arrows to the chest, he is a second rate hawkeye. If you are Indian don’t undersell yourself to the firangi cuz the inferiority complex you carry is n’t good for your self esteem. I still love my mythology and culture.